An expansive reception tent is being constructed to maximize the glamping resort's stunning view of Bear Lake’s turquoise-colored waters. A new Royal Tent Suite will offer the resort’s most luxurious, spacious and private accommodations for couples getting married, honeymooners, or anyone seeking an even more upscale lodging experience than the Grand Tents offer. The Event Tent promises to be Bear Lake’s most spectacular private party venue. Conestoga Ranch, a high-end glamping resort in Northern Utah is poised to become Bear Lake’s premiere destination for weddings, corporate retreats and a variety of other private events. An expansive reception tent is being constructed to maximize the 18-acre property’s stunning view of Bear Lake’s turquoise-colored waters. A new Royal Tent Suite will offer the resort’s most luxurious, spacious and private accommodations for couples getting married, honeymooners, or anyone seeking an even more upscale lodging experience than the Grand Tents offer. The Event Tent will be perched on the hillside overlooking Bear Lake and the surrounding mountains. With 1,700 square feet of space and 15 foot ceiling heights at its peak, the Event Tent can comfortably accommodate up to 100 guests seated at rounds or 125 theatre/ceremony style. The resort’s onsite event planner can assist in all aspects of coordination for weddings, corporate groups, family reunions, and any other celebration. The multi-function space features built-in power to accommodate any creative expression or need, ranging from a wedding band, DJ or corporate presentations and slide shows. The tent measures 50 by 20 feet when the canvas sides are closed, and 50 by 34 feet with all sides open. Two restrooms will be located in an adjacent structure. The resort will plan memorable weekends for wedding parties and their guests with programming that includes a welcome reception, outdoor adventure activities, a pig roast and line dancing rehearsal dinner, groom’s luncheon, a romantic ceremony and wedding reception, and farewell breakfast. The resort’s event planner works with each couple to impeccably manage every last detail of a wedding weekend to forever cherish. Designed to offer a romantic, honeymoon-style experience, the new Royal Tent Suite provides ample space for brides to get ready for their big day, a comfortable seating area, king-size bed with plush linens, and a private, outdoor seating area complete with lounge chairs and a campfire. The en suite bathroom features a cast-iron soaking tub and separate shower. Recognizing its appeal to large families and groups, Conestoga Ranch is adding more wagon circles so those visiting together can create their own enclave and enjoy close proximity around a shared firepit. Conestoga Ranch offers concierge services to create itineraries for groups that include on-site meals, and activities and excursions such as horseback riding, ATV and water equipment rentals. Overlooking Bear Lake’s magnificent turquoise-blue waters just outside Garden City, Utah, Conestoga Ranch encompasses 18 acres and the ability to accommodate up to 178 guests. The glamping resort is designed to make camping easy, cozy and comfortable. 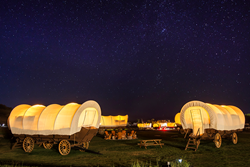 For overnight accommodations, guests can choose from Grant Tents, authentically styled Conestoga Wagons, and Traditional Tents. Each is outfitted with soft beds and fresh linens, and Grand Tents feature en suite bathrooms. Resort amenities include a game tent, Main Lodge with private spa-style bathrooms, Campfire Grill Restaurant, General Store, activities field, Wi-Fi, complimentary firewood and s’mores kits, and cruiser bikes. For more info, visit http://www.conestogaranch.com.